Nocatee recorded the strongest increase in sales for Florida MPCs, with mid-year 2015 activity increasing by 19% over 2014 levels. Sales activity would have been even stronger if inventory had been able to keep up with robust demand. Lakewood Ranch’s year-to-date sales are below where they were this time in 2014 due to a lack of inventory, primarily in the more moderate pricing bands. Lake Nona significantly improved its ranking in the first half of 2015, with sales activity increasing by 16%. The increase in sales at Lake Nona results from having opened two new neighborhoods—Enclave at VillageWalk (priced $600K-$900K) and Somerset Park (priced $300K-$400K). Meanwhile, Laureate Park (their TND section) continues to grow as the community reaches a critical mass of residents, and adds key amenities. The town center will open this year, along with restaurants and a new fitness center. It is worth noting that Lake Nona’s pricing has seen strong growth this year as well. Their average pricing has gone from $343,000 in 2012, to $365,000 in 2013, $399,000 in 2014, and $444,000 in 2015 through June, at the same time as absorption increased. Cane Bay Plantation in Charleston, South Carolina, moved up the top-20 MPCs list, achieving 275 sales during the first half of the year, up 27% from 2014 levels. The community continues to benefit from strong-performing schools, along with continued success at the community’s neighborhood retail center. Sales are also being bolstered by the greater Charleston economy, one of the fastest-growing areas in the U.S., with Boeing rapidly expanding operations, and Volvo developing its first North American manufacturing plant there. 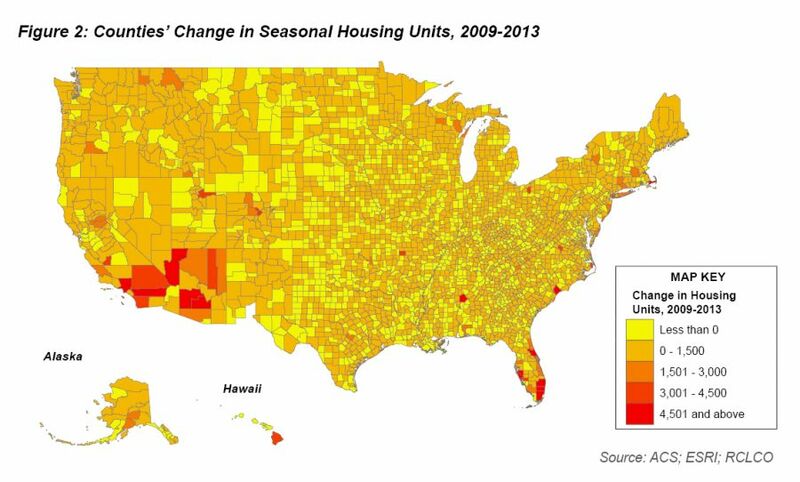 Out west, sales activity is mostly up, with communities in Denver, Salt Lake City, Las Vegas, Phoenix, and Los Angeles achieving some of the strongest growth rate increases over the first half of 2014. Stapleton achieved a 30% increase in sales, driven by the development of new sections in the northern portion of the community as well as stronger demand for higher-priced products. Salt Lake City joined the top 20 list with Daybreak achieving 231 sales, as the community continues to diversify its product mix, and the concentration of retail and services in the area grows. Summerlin experienced a significant uptick in activity, with sales increasing by 32% in part due to the delivery of Downtown Summerlin, which provides additional retail and entertainment for Summerlin residents. Mountain’s Edge fell from the top-20 communities in the nation as the community “nears its final closeout stage.” Vistancia started the year off strong with the addition of active adult sections within each of the communities, capitalizing on the significant concentration of 55+ households. 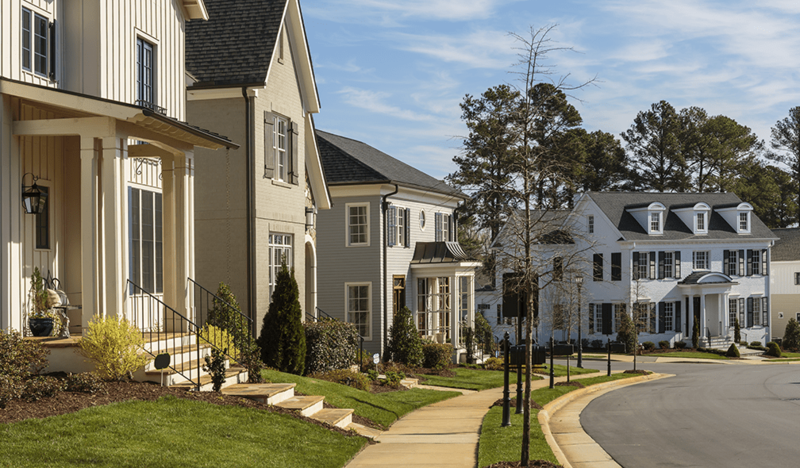 Sales at Irvine Ranch in Southern California increased 56%, as new sections have started to serve as sufficient replacements to older key neighborhoods and keep pace with strong demand. In addition, sales in Valencia, north of Los Angeles, saw an increase of 9% over the first half of 2014, as the community’s segmentation has increased by the introduction of a variety of new products. In Houston, The Woodlands dropped out of the top 20 for the first time since RCLCO’s survey began in 1994 as the community approaches buildout. Other communities throughout Houston pointed to the heavy rains the region received in the first half of the year as the key cause of the slight slowdown in housing activity, with homebuilders and developers unable to start new homes or complete additional lots. Although the rains slowed development activity during the spring, Aliana, Canyon Lakes West, and Wildwood at Northpointe are nearly on pace to achieve similar sales as 2014, and developers are voicing limited concern about the impact of lower oil prices on housing activity despite diminished economic growth from one year ago. In North Texas, the Dallas economy continues to boom, and the area is home to two new entrants to the top 20 list. Phillips Creek Ranch and Light Farms, both developed by Republic Property Group, achieved 236 and 220 sales, respectively, during the first half of the year due to strong employment growth during the first two quarters in the Dallas-Fort Worth MSA, increased community segmentation to penetrate underserved segments, and superior execution and amenity offerings. 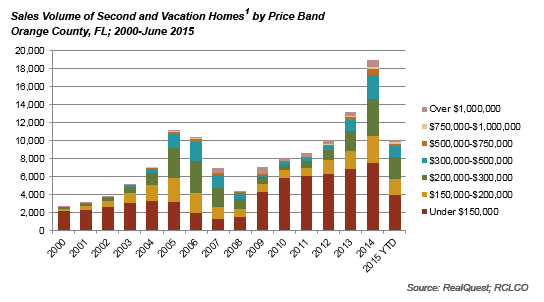 The updated rankings through the first half of 2015 are based on total home sales as reported by each individual community. 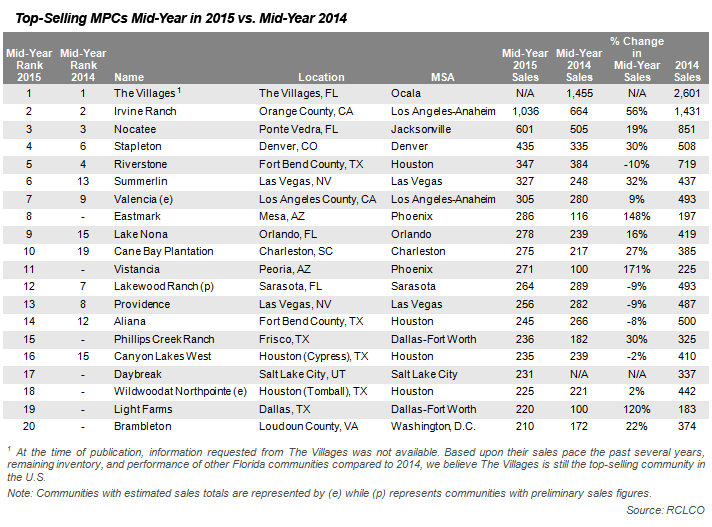 Mid-year 2015 sales for The Villages are estimated from 2014 year-end totals. A revised top-selling list will be published once final numbers are received for all communities. 1 Percentage calculations exclude The Villages and Daybreak. Article and Research prepared by Todd LaRue, Managing Director, and Cameron Pawelek, Senior Associate. 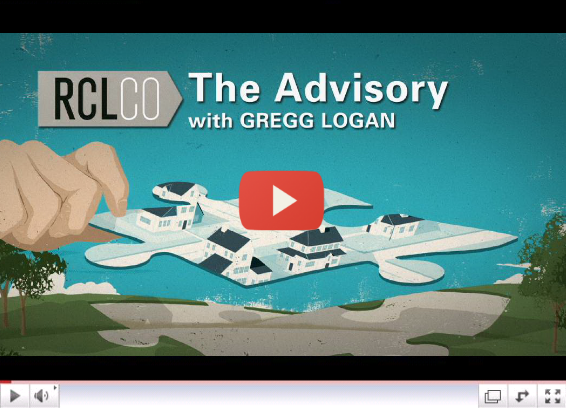 RCLCO’s advisory groups provide market-driven, analytically based, and financially sound solutions. RCLCO’s Community and Resort Advisory Group produced this newsletter. Interested in learning more about RCLCO’s CRAG?Please visit us at www.rclco.com/community-and-resort.